From Joy Mangano, self-made millionaire, entrepreneur, inventor of the Miracle Mop and inspiration behind the acclaimed film Joy starring Jennifer Lawrence comes a breakthrough story of love and hope that will unlock the best and brightest version of you. Joy’s rise from single mother of three to the nation’s most celebrated female inventor is truly what dreams are made of. Full of twists and turns, work and love, obstacles encountered and overcome, Inventing Joy is a binge-worthy book in every aspect. Dive in and be swept along for the ride as she relives her incredible and inspiring journey to joy. But there’s more. Throughout her inspirational rags-to-riches story, Joy points out her very own personal light-bulb moments—lessons that she learned the hard way, and principles she still relies on today. Thoughts and ideas that drive her business, life, and family and are the foundation for her success. These concepts come together in the end to form Joy’s Blueprint, a resource that will help you live your most joyful life—the Blueprint that Joy delivers to the world for the first time. So look inside yourself, grab hold of your dreams, and be brave enough to take that very first step and start your next best chapter. You’ll be in good company with Inventing Joy. One night when I was ten years old, I saved my dog, Duke. It was the middle of winter, and I was sitting in my parents’ bedroom trying to block out the sounds coming from downstairs. My parents were arguing about something again, and I just wanted a quiet place to sit and be alone. Anyway, I looked out the window and saw Duke, our beautiful black German shepherd, in the backyard. Duke could sometimes be grumpy with strangers, but he was always a sweet little puppy dog with me. In the backyard, our small in-ground pool had frozen over, and Duke was walking on the ice. Suddenly the ice cracked, and Duke fell through. No one noticed but me. My parents were too busy downstairs, and my brother, John, was in his room. I ran out the back door and found Duke scratching at the edge of the pool, trying desperately to get out. I was small for my age, and I was skinny as a stick—I used to wear thermal underwear under my clothes just so I wouldn’t look like I was starving—but still I found the strength to grab on to Duke’s paws and pull him out of the water. He was shivering, and all four of his paws were cut and bleeding from scratching against the side of the pool. I took Duke inside and wrapped him in a towel, and I put some bandages on his paws, and I sat with him and held him until he warmed up and calmed down. Over the next two days I changed Duke’s bandages four times. It was hard, messy work, and probably kind of painful for Duke. He didn’t like it, and neither did I. And when I was changing them for the fourth time, a thought formed in my head. So I came up with an idea for these special bandage booties for Duke. The outsides of the booties were like socks, but on the insides I layered gauze pads that I could just take out and replace. I’d slip them on Duke and pull them tight, and that would be that. At first, Duke didn’t know what to make of the booties, and he’d sort of clomp around in them and look at me as if to say, Are you kidding me with this? But after a while he got used to them and didn’t seem to mind. I remember seeing him walk by in his little booties and thinking he looked so cute. I also remember thinking, Okay, they work. The crazy booties work. This is better. I was on vacation with my three young children, Christie, Bobby, and Jackie, in East Hampton on Long Island. One afternoon, the children and I were sitting on a bench outside a bakery on Main Street, eating ice cream. I watched as a man came out of the store holding two white cardboard pie boxes, one in each hand. The man tried to push the screen door open with his elbows, but it kept swinging back and nearly knocking the boxes out of his hands. Finally, he escaped the store. As he walked to his car, he stacked one box on top of the other and balanced them with one hand while digging around in his pocket for his keys. He got them out but dropped them on the sidewalk. Somehow, he recovered and made it into his car with his two pies still intact. It was a little adventure no one paid any attention to but me. And as I watched the man struggle with his pies, a thought formed in my head again. The exact same thought as when I was ten. And in that very moment, I saw it. Clear as day. As a mom, I baked a lot of cupcakes for my children’s birthday parties and school events, and the only thing big enough to carry twenty-four cupcakes was a flimsy cardboard shirt box. I’d put cellophane or tinfoil on top of the cupcakes, but inevitably the icing would get smushed. But what if . . . what if . . .
. . . what if there was a box specially designed for the job? Something with, say, six sides and a little shelf that gave you two separate layers for pies or all twenty-four cupcakes? And maybe the shelf could come out and you’d have enough room for a triple-layer cake! And what if the bottom popped up so the box folded up flat for easy storage, unlike those big plastic tubs that take up all the room in your cabinets? And what if it made life easier for moms everywhere who were constantly baking cakes and cookies and pies for school events and birthday parties and could never really figure out how to carry them? Why couldn’t such a box exist? I grabbed the kids and rushed back to where we were staying. I found some paper and started scribbling drawings of the box. I spent the whole day reworking and refining the design. I saw the entire process in my head: how I could make them, what they’d be made of, the many ways they could help out mothers like me—everything. It was all there, in the air, waiting for me to pluck it out. Just about sixteen months later, the Piatto Bakery Box was born—and it went on to become one of the most popular products of its kind, ever. That moment outside the bakery was an epiphany for me. It was the moment when I realized—truly realized—what I was really good at. You see, other people in the store and on the sidewalk saw the man struggling with his pies, but no one paid him any attention. No one saw what I saw. As far as I could tell, no one viewed the situation quite the way I did—oh, there’s a problem, so what’s the solution? But for whatever reason, I did see it that way. It was just the way my mind worked in that instant. And it made me realize, like I never really had before, that this is who I am, and this was what I do. I see objects that aren’t there. I solve problems no one asks me to solve. I look at life in terms of meaningful, positive, impactful change, even if it’s just a better pie box. I’m an inventor, and I make things. This is the part of the book where I’m supposed to tell you about all the things I’ve made and everything I’ve accomplished. Some of you may already know parts of my story, but many of you might not, so the idea is to set up who I am and give you a reason to keep reading. To be honest, I’m not really thrilled about this part. How do you write about your successes without sounding like you’re bragging? Some people get someone else to do it in a prologue or a foreword—someone notable who can get away with singing your praises to the heavens. But I didn’t want to do that, either. I want this entire book, start to finish, to be like a conversation between you and me. Like you’re sitting with a friend, feet up on the sofa, listening to her tell a story. My whole life and career have been about having direct and heartfelt connections with the people who cross my path and grace me with their trust and attention. I’ve spent thousands of hours on TV addressing hundreds of millions of people, and in all that time I’ve done one thing and one thing only—spoken straight from my heart. I want this book to be the same way. Just me, talking to you, straight from my heart. My name is Joy, and I grew up in a working-class part of Long Island in New York. My father ran a bus company, and my mother took care of me and my brother, John. Things weren’t always perfect in our house, but they weren’t always bad, either. Growing up, I was insecure and not very popular. I can’t say I was a quiet person, but I definitely wasn’t flashy. The people around me, though—they were flashy. My father, Rudy, who drove big lime-green cars and wore white boat shoes, and my mother, Toots, who liked to wear big stylish hats everywhere, and later on my husband, Tony, an aspiring singer and life of the party who wasn’t really ready to be a father to our three children. In my thirties I felt like I was losing control of my life, so I took charge and made some changes, and I rediscovered who I could be. Then I invented the first self-wringing mop, and that changed everything. I called it the Miracle Mop, and in the early days my children and friends and family helped me build the first 1,000 of them out of the back of my father’s auto body shop in Deer Park, Long Island. I convinced someone at QVC, a new electronic retail TV channel, to sell the Miracle Mop. And despite having zero TV experience—and a terrible fear of public speaking—I wound up on the air selling the mops myself. Not too much later, we were selling millions of Miracle Mops a year. How did I do it? How did I sell so many mops on TV? I did it by talking straight from my heart. After the Miracle Mop, I just kept seeing things that weren’t there. I came up with the idea for a better, slimmer, more efficient closet hanger, which struck most people as an unnecessary solution to a nonexistent problem. A hanger is just a hanger, they said. Who cares about hangers? Well, I did, and so did a lot of other people with messy, overstuffed closets and nice clothes that kept ending up on the floor. I launched the Huggable Hanger on the Home Shopping Network, and it became the single best-selling product in the history of HSN—and all of TV. More products followed, and more successes, and nearly all of my inventions earned the Good Housekeeping Seal, my own personal benchmark for quality. Fast Company magazine named me one of the 10 Most Creative Women in Business, and People magazine called me The Billion-Dollar Mom. Each year my appearances on the shopping channel HSN are beamed into more than 90 million homes. All told, I’ve designed and invented more than $3 billion worth of products, all of them for people just like me. Still, my proudest achievement, besides my three beautiful children, is the little company I started back in 1991, Ingenious Designs. It grew big enough for me to employ more than 200 people, including two of my children (who aren’t children anymore, and who gave up impressive careers of their own to come work with me). My mother, Toots, and my father, Rudy, also came to work with me, even after they were divorced (I did have to put them in different parts of the building). Over the years, other friends and family came on board, including, believe it or not, my ex-husband, Tony. I guess I look at the concept of family a little differently than some people. I believe that just because bad things happen in relationships doesn’t mean there isn’t something worth saving there. I believe in circling back to people and seeing the good in them instead of the bad. Yes, I’m an inventor, and, yes, I’ve sold a lot of products and won awards and all that, but if you want to know what matters most to me—what makes me me—it’s family. So if you share my belief in the power of ideas and dreams and family, I hope you’ll keep on reading. I believe we are all capable of great creativity and great productivity and great achievement in our lives. I believe we can all make meaningful, impactful changes that will make the world around us better. We all have unique tools and talents and abilities that, when deployed with true passion and purpose and courage, can produce astonishing, magical results. I believe these things because I see how far I’ve come with my own set of tools and talents and abilities—and it’s a lot farther than I ever dreamed I could go. Which brings me to the reason why I decided to write this book in the first place. You see, it’s been a long and incredible journey for me, from skinny little Joy to single mother of three to the great here and now. And through it all, I managed to defy a lot of conventional wisdom, and I developed my own set of truths. Today, these truths are my core principles—they are what I live by each and every day, in every aspect of my life. And any one of them, on its own, can help you make a meaningful change in your life. But taken together, they form a kind of guide that I use to make positive changes in the world around me. I call it my Blueprint. My Blueprint for a more joyful life. So, technically, this book is not a memoir or an autobiography, although it does tell the story of my life. And, technically, it’s not a self-help book, either, though I certainly hope it proves helpful. To me, this book is a shared moment between me and you. As I tell you my stories, I want you to feel like you’re right there with me, facing the same obstacles, figuring out solutions, taking the journey with me. Along the way, I’ll pause in my story, but only when there’s something really important I want to point out to you. It won’t happen in every chapter, but close to it. I’ll even use a little light bulb——to help mark these moments. Because I want you to learn what I learned, exactly when I learned it. And in the end, after all the stories are told, we’ll come back around to my Blueprint. We’ll walk through it together, and we’ll see if some of it might help you build your own brave and creative life. I know with all my heart that you can carve a beautiful, joyful path through the world. And I hope my story can inspire and empower you as you take on the most courageous task of all. 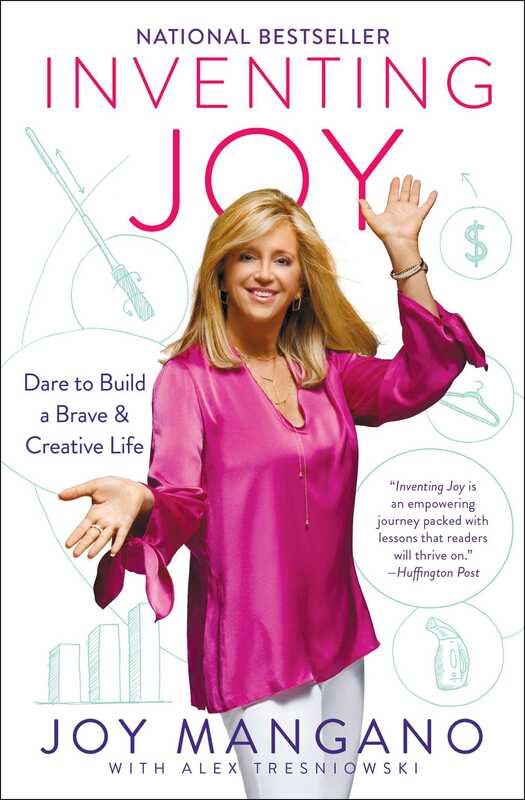 Joy Mangano is one of the most celebrated female inventors of her time, having created and sold nearly $3 billion of product over her storied career. Beginning in her father’s auto body shop, Joy invented and launched the self-wringing Miracle Mop, and she hasn’t looked back. Joy has gone on to invent and launch hundreds of successful products across virtually every category, most notably Huggable Hangers, My Little Steamer, Forever Fragrant, and luggage with her revolutionary Spinball Wheel System. Dispelling myths and breaking barriers every day, Joy was one of the first in her field to harness the power of TV to connect and communicate with her customers, and today she is one of the most trusted and influential voices in her industry. Her undying promise: ideas and innovation that make life a little better and a little brighter. Joy currently appears on HSN (the Home Shopping Network), once a month, reaching more than 90 million homes live. In addition, Joy’s products can be found in premier retailers such as Macy’s, Target, Bed Bath & Beyond, Meijer, Lowe’s, and The Container Store. Joy is also the owner of acclaimed fine dining restaurant Jema in Long Island, New York, and is the founding director of the Joy Mangano Foundation. Follow Joy on Facebook @JoyManganoOfficial, Instagram @JoyMangano, and Twitter @JoyMangano.